If Inter*Face had a little destabilized his fans, Klaus Schulze succeeds to calm them with an album which makes the bridge between his digital era, his more orchestral one, as in X, and the analog one with scents of Moondawn and even Timewind tied in some great orchestral and digital movements. It's the best of his worlds on one superb album. "Klaustrophony" is the cornerstone of “Dreams” and, honestly, one of the very good pieces of music in the repertoire of Klaus Schulze. It's a mixture of Timewind and Moondawn with the tones and the technologies of today. Ringings float in a dark universe. I'm hearing ghosts of Mirage here. They are supported by a soft and very subtle sequenced line which plays with its reverberations and the ringings of the twinkling keys. Does it recall something to you? This portion is pure musical poetry. A symphony of glass. The musical envelope takes shape around a dark synth which releases harmonies of which the discretion stays of silence in front of an orchestral thick cloud of strata and a choral with the Schulzian ghostly harmonies. Snatched by the eye of a slow musical cyclone we hardly notice that "Klaustrophony" gets dressed of the same chords pattern which surrounds the whole of “Dreams”. The movement increases with denser sheaves of violins and percussions which hammer a pace while rolling with delicacy, such as to protect a movement which reminds me of Crystal Lake. In the harmonious density of "Klaustrophony" an acoustic guitar makes its appearance. Nunu Isa pinches its strings with such emotion and sensibility. This is outstanding. And the drum becomes more incisive and hammers this passage with echo, giving it so another harmonic deepness. The highlight is for its height. Schulze delivers here a grand title. The Berber voice of Ian Wilkinson is just in time and fits just with the tone of the emotion and admirably well in the middle of these violin strata and the increasing orchestrations, enriching a musical structure which swallows every chords with greediness to make it run indefatigably in a harmonious spiral. Wilkinson's intonations and changes of tones are simply perfect and bring a lot of emotion to this great track which worth alone the buying of “Dreams”. Although written in 2003, "Constellation Andromeda" is a great piece of music. Written within the framework of a musical show for the Alesis synths, "Constellation Andromeda" was released as a limited edition single named Ion. Soon the bootleggers made of it their rights and sold it at high price all over the net. Having no other track to fit in the “Dreams”, Schulze selected this track to fill the usual time frame of the Revisited Records series. Although quite different with its bouncy structure of rhythm in a more musical contemporary envelope, I got to write that it's a judicious decision. "Constellation Andromeda" stands on a minimalist jerky spiral where the icy chords stagger in a mist made of blue particles. As the track evolves, the rhythm and the mood get louder and jerkier with bass drums filling the blanks between a staccato move. Already back in 1986 “Dreams” was in the worth of its price. "Klaustrophony" and "A Classical Move" were by then among the inescapable of Schulze. Now just imagine these with a new improved sound structure, a beautiful notebook and a bonus track which is beyond expectations. This is Christmas all year long! If the whole of “Dreams” can't be considered as a masterpiece, these three tracks together are purely one. It's an essential work in the repertoire of Schulze and probably his best of his digital era. When disorder, the sound anarchy does hair of an increasing interest, it gives “Chronowizor” from Wladyslaw Komendarek. The first time, and the only one, where I lived the Komendarek experiment was with Przemyslaw Rudz's Unexplored Secrets of REM Sleep. We clearly felt the influence of the founder the group Exodus, who likes an abstract music imagined by diverse sound samplings, on an album which brought Przemyslaw Rudz near the artistic madness. This is exactly the basis of “Chronowizor”. Only the music differs. Instead of grafting his quirky tones and hiss samplings of schizophrenic voices on a more or less ambient EM, Wladyslaw Komendarek explores a musical approach closer to Krautrock and more experimental electronic territories. And it gives an amazing result. Because behind this strange ambience of cacophonies of the genres and the atmospheres is hiding some superb musical structures which end to give reason to the excesses of Komendarek. 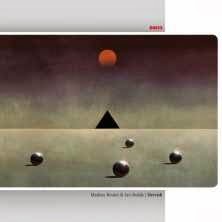 And the eclectic sound universe of the enigmatic Wladyslaw Komendarek begins with "Privatized Brain" which presents a cheerful structure of rhythm. This is 13 minutes skillfully hammered where we tap of the feet and we question of the ear. The structure is supported by some good strikings from Zbigniew Fyk and sewn by the organic chords from Dariusz Zalusk's line of bass, but also where are winding some jingles of chains which oversize the reach of the rhythm. A little more and one would say Alice Cooper and his Welcome to my Nightmare. This clearly rock approach disconcerts as much as the direction is taken "Privatized Brain" which sees itself wrapped by a meshing of feminine voices which floats on this strange hybrid rhythm while chords of electronic piano redirect it towards a kind of fusion between a lounge style and a psychedelic down-tempo. If the tempo is hammered with the regularity of a hypnotic clock, the atmospheres and the harmonies are parading like a surrealist sonic landscape where sound and vocal effects weave a psychedelic frenzy which drags "Privatized Brain" towards a Jamaican kind of tribal approach. Misted of static currents, the introduction of "Clouds of the Virtual World" scrapes the ear while that charmingly the track dives towards an approach of big sensual blues which crosses the American Big Band and music striptease of the Moulin Rouge of Paris. You have to hear these synths mold orgasmic lamentations behind these false delirious trumpets. Awesome! Did I say; when the sound anarchy does hair of an increasing interest? If the first two tracks are not perfect examples for you, let's see for the title-track where the first chords fall such as invisible threats. We can hear a very Dreamian influence behind this introduction where a vocoder marries the curves of a processional ambient rhythm. 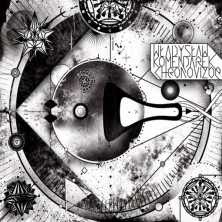 And as everywhere on “Chronowizor” the synths weave strange spectral harmonies which roam without really wanting to flirt with melodies. Here they mew like wandering cats on a structure of rhythm evolving slowly with percussions which click in their echoes, preferring the wrapping ambiences of a heavy mellotron veil rather than a rhythm hard and pure. And like that, without warning, "Chronowizor" sinks into the gaps of dissonant noises before giving the last jolts of an incongruous rhythm, a little like a cat on an artificial breathing apparatus which dreams about junk food in the country of big cats without appetite. I'll be very honest here; “Chronowizor” is not for all the ears. Besides caressing a multitude of musical styles, the Polish synth wizard waters abundantly his music of sound effects which find all the beauty of their dimensions with ears lend to suffer in a good headphone. The boldness of Wladyslaw Komendarek, and this contrary to several artists of the kind, doesn't get lost in cacophonous ineptitudes where only the immoderation can be attraction for those who like boasting of marginality. In the disorder, in the chaos, his titles always breathe of a musicality from where pop out harmonies which are not afraid of being friends with a kind of musical impressionism. This is the biggest strength of “Chronowizor”. Each week brings its lot of demands so that I can write a chronicle on an album of an emergent artist. If some the EM proposed some goes away from the borders of Synth&Sequences or inspires few interests so that I speak about, others on the other hand present a very mature EM while certain artists show a strong potential and a beautiful musical signature which deserve amply that we speak about them. And this is the case with Janneh, a Finnish artist who seems clearly inspired by the rhythmic approaches of Jean Michel Jarre and those more theatrical of Vangelis. “Solarization” aims to be a mini concept album of 34 minutes about the solar energy and its importance in the story of the humankind that the multi-instrumentalist from Piikkiö, he plays as well keyboards and synth as piano and guitar and even percussions, presents by the means of 7 themes which, if they are clearly separated from each other, turn around the same delicious harmonic pattern. The introduction of "Solarization I" plunges us into a heavy ambiospherical phase with a mixture of hollow winds and prismic drones which blow in the infinity. The percussions shake the mood which illuminates itself by a rather Babylonian musical synth and of which the wrapping layers are pouring idly over a bed of shimmering arpeggios The approach is rather pompous and kisses the soft vocal of sibylline oracles before borrowing the phases of a sober symphonic electro-pop where the solos of synths sing with some absent choirs on a line of sequences with some undulating alternating keys. I easily hear Thierry Fervant's harmonies on this first track which is a faithful reflection of what is coming all along “Solarization”. 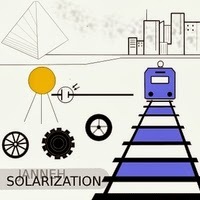 After an introduction which solicits these sequences to sneaky skips, "Solarization II" dives directly into the heart of Janneh's influences with a beautiful electronic ballad to the aromas of the 80's when the harmonies, the percussions and the synths were perfumed by Jean Michel Jarre's essences. It's a small wonder and a very catchy track. The kind which would easily played on the air waves of radio pop. The opening of "Solarization III" revisits the lines of crisscrossed sequences which opened Vangelis' Chariots of Fire. Well, the moment is brief but pronounced enough to ignore it. Afterward the music adopts a kind of languishing blues where Janneh makes melt his solos of guitar in those from his synth, which are rather catchy i got to say, on a slightly hopping structure of rhythm. "Solarization IV" presents a rather misty approach with a rhythmic skeleton which scatters its bones in an industrial ambiospherical ambience. A ghostly solo awakens a mechanical rhythm a little after the first minute. The rhythm throws its strikings of percussions which resound and smother in a rebellious structure where the synth divides its harmonies in some solitary solos, while drawing beautiful Arabian orchestrations. And Janneh introduces us into a Middle East tribal phase with "Solarization V" and its structure of rhythm which quaver in a soft serpentine stroboscopic. It's a great and solid track which gathers all the electronic ingredients that please with its chain of sequences which glitters in the background, its good tribal percussions, the guitar riffs and, especially, the superb Arabian orchestrations which plunges us into the oniric kingdom of 1001 nights. As much dreamy as melancholic, "Solarization VI" is a sad melody which scatters its notes of piano in some floating mists, such as sighs which get lost in the winds. "Solarization VI" closes this first musical essay of Janneh with an ambiospherical futuristic approach with scents of lounge jazz à la Blade Runner. I really enjoyed this first musical rendezvous with Janneh. It's obvious that he has talent, senses of writing and a way to build orchestrations that sound so much like Jarre or Vangelis. None of the 7 tracks presented on “Solarization” is boring. On the contrary, each possesses this thing which forges musical itches. Whether it is in the rhythms, even the most accessible ones, or the floating cinematographic atmospheres, Janneh weaves a universe full of charm which says to me that the best is to come. This is a beautiful discovery which is worth its cost. 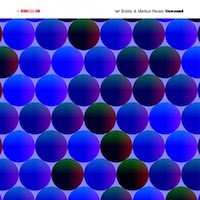 I have adored Ian Boddy & Markus Reuter's last collaboration. Derwish was an audacious album where abstract electronic structures flew on curt rhythms, a little as in the universe of King Crimson. “Colour Division” drinks of the same musical pattern, as for the ambient side as for the rhythmic structures, than Derwish. If the rhythms are less hard-hitting, the ambiences are always so intriguing, even disturbing. Here is a review about a seductive work where the music does more than drawing some harmonies. It cements them skillfully in a sonic world made of abstractions. A synth snores shamelessly. Letting go its snores which swell into long twists with resounding contours, the synth invites the lamentations of Markus Reuter's electric six-strings to weave an ambiospherical opening which flows on a bed of twinkling arpeggios and throws itself into a heavy rhythm, hammered by e-percussions and by their effects of echo. The hymn of heavy rock reminds me of Home by the Sea from Genesis. It's a rhythm which scatters its heaviness among ambient phases, there where sparkle some arpeggios of glass and cry passive guitar solos, to reborn of its incisive strikings and transports "Borderlands" towards a heavy progressive industrial electronic rock which kisses the herculean madnesses of King Crimson. The solos, as much from Ian Boddy and Markus Reuter, decorate a boosted ambience which already places “Colour Division” in a class of his own. After this first heavy track, the title-track plunges us into deep ambiospherical phases. A sonorous black hole where dark mourners lines structure an ambient pattern which supports marvellously the floating, dreamy and sometimes heart-rending solos from Markus Reuter who is as inspiring as inspired. This is a very beautiful track which sets the table to the ambient phase of “Colour Division”. Some dense veils of synth wrap the opening of "Crescent", a bit like a night which covers itself of its blackness. The first two minutes are stunning with their effects of sonic envelop. A delicate line of bass draws a lunar beat that strata coming from a fusion of synth and guitar are caressing of soft lamentations. It's a deep cosmic ambient mood which gradually sinks into a Black Sea where oscillate some waves agitated of contrary spasms. Like carillons swirling in static winds, a small symphony of ringings awakens "Fulcrum". It's the quiet before a sound storm, because "Fulcrum" veils itself of a sonic schizophrenia which unscrews the eardrums. Riffs of guitars roars behind this glass pattern and plunge the track into a rhythmic heaviness where the pulsations shape a slow furtive rhythm. A rhythm which beats hypocritically in a black ambience papered of insistent knocking, felted explosions, furious riffs and lamentations of a corrosive guitar which ululates of a profound sound pain. It's rather intense, just like "Reveal", even if both structures are totally in contrast. It's a superb electronic litany very ambiospherical where we have difficulty in targeting the spectral lamentations of Ian Boddy's Serge Modular from the ghostly tears from Markus Reuter's wandering six-strings. The movement breathes of a ghost rhythm by means of a bass line which pulses such as a beat in agony. Disturbing of magnetism! The main attraction of “Colour Division” is this constant duality between the synths and guitars which muddle up the hearing, so much the tones mix themselves in a perfect symbiosis. Like in "Beacon" where they cry in the fogs of percussions and felted jingles. Percussions which little by little get loose and structure a rhythm which bursts such as a popcorn in a test tube. The line of bass is vicious at will and waves hypocritically on this structure of rhythm so imperceptible than indefinable where cry, where sing this fascinating meshing synth/guitar. "Slowfall" ends this last work of the Boddy/Reuter tandem with a somber ambiospherical structure a bit apocalyptic where floats a smell of disaster splendidly painted by this mesmerizing fusion of eclectic tones. Mixing subtly the heavy rhythms with some superb metaphysical industrial atmospheres, Ian Boddy and Markus Reuter sign a 4th opus which respects the artistic territories rebellious of the duet to the very avant-gardist musical visions. There are smells of Derwish behind “Colour Division” and it is correct like that, so much both works complement each other due to their sound peculiarities. Even if the rhythms are less heavy, less hard-hitting, the atmospheres are blazing. And the chemistry between these rhythms and atmospheres is as much attractive than a water singing on corroded corals. It's a feast for the sense of hearing. The DiN Records label produces some of the fine contemporary EM music and “Dervish” is the most beautiful example we can point out. It's an album with a rich sonic pallet where the crystalline tones are erode by analog ambient noises which sizzle on random rhythms, or ambient moods, and simply divine orchestrations made possible by a nice string quartet. In fact, “Dervish” is a pearl in the ears of the most avant-gardist music lovers who enjoy as well the cold electronic pattern and the warm rhythms of progressive rock. And the rendezvous for the audacious begins with a curt, nervous and jerky beat. Sat on a roaring bass line, incisive percussions and edgy guitar riffs, the title-track explodes on a structure of rhythm which starts and stops abruptly. We enter the universe of King Crimson, Red and Larks Tongue in Aspic eras, with Markus Reuter' six-strings serpentines which roar and float on a spasmodic beat and where the discreet violins amplify this impression to penetrate into the tortuous Robert Fripp's world. The percussions are in the tone. They are abrupt, nervous and bang with the surgical precision that Pat Mastelotto, drummer of King Crimson by the way, unstitch with fierceness. This is an inspired introduction which amazes, coming from two accomplices who, in my mind, seem to favour a more ambient style. The ambient portion remains not less present with a synth and its veil of strata which are at both invisible but captivating. Rich in heterogeneous tone, "Dervish" is just like the rest of the cd with a pleiad of samplings and the lazy languishing orchestrations which bury a hyper nervous pace, like on the finale of "Dervish" and the opening of "Stealth" and its pace which progresses with hesitation among the scattered chords of a guitar and of its evasive harmonies, even ghostly. Less corrosive and more intriguing, "Stealth" flows into an austere mood with a soft melancholic guitar from which comes lugubrious lamentations. These strangely attractive tones are scraping the ambiences beneath some heavy pulsations with rough contours and a synth with floating strata. Slow but not deprived of rhythms, "Stealth" is a logical suite to opening track with a twisted atmosphere where the rhythm breathes at small dose, bending the back and refusing the caresses of this fusion of synth/guitar which tries constantly to retain its flight. Soft e-percussions open "Tableaux", like some kind of hampered tom-toms covered of a dense synth veil. Here the movement is like the one of a clock from which the irregular tick-tock tries to protect its time while it feels trapped in a metallic trap to the embraces of corrosive metal which wave into resounding lamentations. And like everywhere in “Dervish”, the atmospheres are fed by contiguous tones which have nothing to do with the structure of the track but which roam in a soft creative madness and surround "Tableaux" of a sonic structure to thousand limpidities soaked into glass of steel. After a "Joker" as much incisive and rhythmical as the title-track, "The Watcher of Loneliness" opens with chords which drag in a ghostly ambience where a pleiad of white tones decorates a spectral universe surrounded by strata as cold as metal can bite. This is a purely atonal movement disguised by a crowd of sound samplings which climb such as some ivy in an ectoplasmic ambience streaked by lamentations from the outer grave. "Angst" illuminates itself with soft percussions which flitter in a dark ambience tinted by the scattered notes of a discreet guitar. The movement undulates with deaf pulsatory hammerings before crossing a monstrous orchestration which swallows the piece under an avalanche of unbridled percussions. It’s a piece of music as strange as the world of contemporary music can digest, but with an undeniable attraction for the sound purity. "Spiral Manœuvre" ends “Dervish” with an ambient static movement where tones of glass push the piece towards floating horizons with a pleasant mellotron synth which draws a dreamy structure that strata of guitars marry at the middle point, pursuing this contemplative sound bubbling towards an infinite tranquillity. “Dervish” is a staggering work, both by its aggressiveness and by its ambient structures which crosses sound storms à la King Crimson. It's an opus with a surprising sound resource which collide the sense of hearing without detour in a crystal clear sonic world so precise that we would believe to be installed in a glass bubble which reflects the sound with a complexity which remains the privilege of the musical world of Ian Boddy and his label DiN Records. “Unwound” addresses to those who devoured Derwish. In fact it's Derwish, but boned! Derwish seen again and remixed by Ian Boddy who, track by track, removed all rhythmic structures, letting glide some sulphurous spectral lamentations coming from string instruments and wind instruments which team up and merge in an atonal musical universe of which the intensity hunts the intense guitar of Markus Reuter. From the first mislaid chords of "Mode I" we guess the skeleton of Derwish with this guitar à la Fripp which switches shape for a set of violins and of its ochred and metallic breaths. No rhythms, only those violin flights which intertwine with soft loops of guitar amply dissected and devoid of its primary identity. Uninteresting? Not completely. Pushing the sonic exploration and the exploitation of tones to its maximum, Ian Boddy succeeds to create a surrealist mood where all kind of tones get shape in a timeless atmosphere with exhausted beats, as on "Mode II" and "Mode VI", where the tones of strident flutes congeal the harmonies in a shrill musical pewter. Where totally atonal movements are floating above some soft oscillations and overfly lazily a darkness moved by oblong pulsations, like on "Mode III" and "Mode IV". With its soft fluty approach, of which the echo of the sound reflections get lost in the lamentations of a guitar that Reuter strongly pinched the strings, "Mode V" is doubtless the most beautiful track of “Unwound”. The most accessible too, because very sensitive with its oscillating stridencies which evaporate in the tearing of a solitary guitar whom we guess with difficulty, so much the tones adopt a sound acuteness to make burst a crystal of renown. "Mode VII" ends “Unwound” with a serial choir where the choruses get graft to the weak fluctuations, deviating into obscure corridors of incantations where the lack of movement stays the main agony of a Spiral Manœuvre survivor, from the Derwish album. In all honesty, “Unwound” is not synonymic of commercial music. It's an audacious sonic experiment, available only in a download format, which deepens the bases of Derwish. But a ghostly Derwish to which we removed all of its rhythmic structures and turn them into 6 motionless segments as much spectral as metallic. 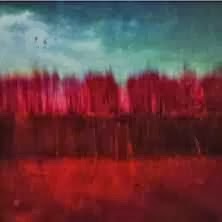 It's a kind of industrial ambient music which leans on slow and often shrill oscillations and where Ian Boddy weaves the paintings of his imagination beyond the structural limits of Derwish. It's an intimist introspection which feeds very well the pond of experiment of the sound structures to the similar themes. Something that the DiN Label proposes since its foundation. An album for curious ears and for open minds! Ian Boddy is one of the most avant-gardism musicians to be. Pioneer of the English EM scene, he released his first opus in the beginning of the 80's with The Climb. Always attracted by the more progressive and darker borders of EM, he created his own label, DiN Records, to acquire a bigger artistic independence. Since then, his label produced albums which embrace all the borders of contemporary EM, whether it is experimental ambient, Berlin School style and IDM with an industrial touch. His union with Markus Reuter thus has nothing surprising. Markus Reuter is this German guitarist that we discovered recently with his last solo album Trepanning and also with his surprising collaboration with ['ramp]. He is a pioneer who plays the Warr guitar, a strange instrument where we knock on the strings instead of pinching them. “Pure” is the 2nd collaboration for this very avant-gardist duet who had released Distant Rituals in 2003. An album that the criticisms considered very ethereal. On “Pure”, the celestial side is almost absent. We rather float in a world of glass. A crystal universe which surrounds us of light floating and motionless movements. A foggy sitar releases felted and uncertain chords to open "Prescence". It's a track with a delicate movement which sounds like an unreal lullaby, so much the crystalline tones of the chords leads us towards a sleep to the harmonious carillons. And this is what strikes the most while we hear “Pure”; the subtle delicateness of the tones. The purity of the sounds, of the links and the chords transposes us into a world of subtleties where the sonic pattern flutter about, such as freeze crystals and whose music builds up itself by their frictions and their furtive contacts which are moved by winds matching the dances and the movements. Throughout the opus, Boddy/Reuter mixes the beats and ambiences on chords of pure crystal which emit superb tones of a halieutic transparency, as much as on tracks enlivened like "The History" and "This Life" and softer tracks. The intro of "Glisten" filters a superb serpentine with chords shimmering on a floating synth and a tonality growing with a distressing crescendo. "Immersion" and "Clearing" come to change the moods. Floating, "Immersion" starts on clear chords, like an electronic xylophone, which float in a quilted ambience. A guitar comes to spread its short segmented solos, followed by a synth which conceals its choirs to set ablaze a long ethereal movement, like on the title-track and the moods on Distant Rituals. "Clearing" is purely experimental. Motionless, its charm lies in the mutation of the sound effects on the crystalline serpentines which succeed in maintain an effect of harmony. And the crystal journey goes on up until "Pure" and its crystalline sonic pattern. A track with beautiful modulations and limpid keys which wind this strange universe, wondering which of the pure or the impure would be the best companion to be with. Ian Boddy and Markus Reuter are, what we can guess, sound searchers, sonorous diggers. Two musicians who explore forbidden territories, going into an anti-music shape which aims to be all the same harmonious even if quite discordant by moments. If "The Level" brings us on an a little more progressive side with its acoustic guitar, the other tracks are as well soft as strange with a transparency which hook the sense of hearing. “LiveMiles” is the last album of Tangerine Dream's short association with Jive. A period called Blue Years. It's also the last album of the Chris Franke's era, who left the band on August 1st, 1987. In fact, and not because it's a bad album, on the contrary, “LiveMiles” is the swan song, the beginning of the end, the last of the great ones, the end of a great era... call it whatever you want, from Tangerine Dream and the first one of an illogical suite of deceits and swindles which will serve to fill the big woolen pockets of Edgar or the financial dinosaurs which roam behind the ghosts of TD. This is a dark side in the history of the group which I hope will burst out one day. Because the fans have the right to know what has really passed in this time, and afterward. Just like for “LiveMiles”, they have right to know, to say the least to understand from where origin this idea to make in studio of the false albums in concert as this one, Soundmill Navigator and The Perth Tapes from the I-Box set. Let us be situated in the context. In that time there was no internet, nor social networks and the concerts of the Dream almost went unnoticed in the local newspapers. Thus, the fan who bought himself “LiveMiles” in that time did not know that it was about a pure and simple hoax. That it was a false live album, where Edgar Froese has Froesenized the structures while bringing to it bits of rhythms never played in concert. The result is not that bad, on the contrary. I think that it's a very beautiful album. It is just not a real live album. But does it really matters? 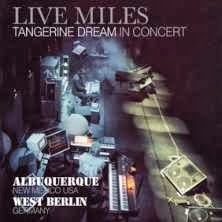 “LiveMiles” is supposed to reproduce two long lengths extracts from concert that Tangerine Dream performed in Albuquerque on June 8th, 86 and in Berlin at the West der Republik on August 1st, 1987. Now that we know that's not really true, let's jump in it. "Livemiles I (The Albuquerque Concert)" is consisted of 4 segments; Green Trail Part, Section 2, Section 3 and San Buena Ventura. Three days later, Tangerine Dream gave a concert in Denver with a completely different setlist and especially a music quite as different. While the concerts of the North American tour began with Pilots of Purple Twilight and Stratosfear, in fact the setlist turns around Le Parc and Underwater Sunlight albums, "Livemiles I" plunges us rather into the ambiences of Tyger and the London track as well as the electronic rock hymns à la Optical Race, 2 albums which will go out in 1987 and 1988. An oblong mellotron veil à la Genesis' Watcher of the Skies comes down slowly to evaporate in the chords of a heavy and hesitating rhythm. Some notes fall with heaviness, accompanied with a hesitating flute on a tempo which has difficulty to set itself in motion. We hear perfumes of Optical Race there, but much more of Tyger with a sort of remixed version of London. A London that we recognize vaguely with an uncertain, furtive rhythm which goes round in circles on percussions of a Tablas style. It's a meshing of percussions and hectic sequences which peck the uncertainty of a rhythm which drinks of superb fluty passages. The rhythm takes off at around the 6th minute with sequences supported by electronic percussions, plunging Green Trail Part into a good electronic rock with a synth to vocals charms. Edgar did a remarkable job because we have difficulty in recognizing the lines of Tyger which goes astray in lost sessions of Optical Race. He plays with rhythms and ambiences, outlining some great melodious passages which catch the ear. Dramatic passages where he tortures his electric guitar, like in Underwater Sunlight, but also in a slow version of London Part II (Rotten Row Patriot). It's rather poignant. And I have to make amendment; there is a lot of soul and passion behind "Livemiles I" in particular with Section 2. Section 3 plunges us into a furious electronic rock with a good sequencing pattern. The rhythm is heavy. Arched on an ascending structure, it's filled by these synth pads with bright contours which became the trademark of a more metallic Tangerine Dream. San Buena Ventura encloses this mini-concert in studio with a revamped version of Song of the Whale Part 2, unless it's a leftover from Legend? Bets are opened. But that remains good! If we have guessed right from the tips of our ears and from the bottom of our knowledge the setlist of "Livemiles I", the exercise will be as much difficult with "Livemiles II", the concert at the West der Republik. There, we have the true setlist of this memorable concert and that doesn't look at all to what is going to happen on “LiveMiles”. The introduction, Caspian Sea, is of silk and is faithful to the first 8 minutes of the concert, with a beautiful mixing and some good overdubs. This is a great unreleased track. It's a beautiful morphic ballad which swirls like an oniric lullaby in a foggy synth which sings of a discreet synthesized voice. The guitar comes to cry in beautiful lamentations and adorn a kind of crescendo filled by a dramatic adrenalin. I love that! While we are supposed to hear Dolphin Smile, we are entitled to another unknown track. And the whole thing is very well linked, as a real concert. So Velvet Autumn offers a marathonian structure. It's a kind of rhythmic running where the sequences and percussions are structuring a sustained rhythm which serves the cause to soft fluty harmonies and keyboards riffs. I don't know... I kind of hearing things that remind me of Marakesh from Optical Race. We fast did the ballot. It's a little bit too long track which is in the time of Underwater Sunlight. "Livemiles II" ends with a very anemic version of Dolphin Dance. Here Edgar has too much Froesenized the product, making it insipid. Well, here we are! Only the crazy ones won't change their idea. After having heard closely, and having searched through the Net, I got to say that this “LiveMiles” is a solid mixed album, even Voices in the Net qualifies it as a studio/live album, where the arrangements of Edgar and the extracts of the two concerned concerts give us good moments of listening. Except that I am always a little bit shocked by Edgar's attitude which tends to take the worship of his fans as a way of filling his deep pockets. But this is another debate that I won't start! It's not to me to do so. I prefer the Albuquerque section which, needs to admit it is a very good remix of London. Is this version of Esoteric better? I heard it is, but I don't hear such a difference here, except that the sound is more powerful. And in the end, it's a beautiful album, no matter its controversy. It's an old friend who calls out to us right from the start. A fusion of guitar/synth shapes some slow morphic layers which float like sighs of hollow winds. We feel at ease. We are on familiar ground. Fragile, the notes of a piano as pensive as hesitating are falling down and forge a somber lullaby which is lacking of finishing. We roam in our dreams, as well as in our soul, when the percussions harpoon the meditative approach of "UnUsual Thursday". Their strikings draw a delicious down-tempo which swirls with so much sweetness. And quietly, behind these ochred breaths and these fractures to tenderness by the drum, the piano tightens its notes and forges a delicate melody that a six-strings embraces of its ghostly harmonies. I always liked the music of Darshan Ambient. I became fond of this American bard who drags his airs of mislaid blues or troubled folk in a fascinating neurasthenic mood since my ears crossed his very beautiful A Day Within Days , back in 2010. Following the precepts of melodies and ballads darkened by the mesmerizing melancholic approach of Falling Light, “Little Things” deviates a little, on the other hand, from the usual route of Darshan Ambient by borrowing the delicate fragrances of an ethnic world, both African and oriental. This fusion of urban and ethnic folk brings some delicious colors to an album from an author with a torn soul which always has the gift to make vibrate the ropes of a sensibility repressed in the courses of a life. If it's often black in the world of Darshan Ambient, the rhythm always has its place. A rhythm tucked by a ballad approach, like in "The Mystery of Sleep". The approach is kind of tribal with these tears of violins which cry, while chords of guitars float with pensive harmonies which remind the universe of Patrick O'Hearn. The percussions are structuring an ambience of ethnic jazz on a structure of rhythm a bit dishevelled and stroboscopic. The voices, the bells plunge me into the superb Amerisynthecana from Sensitive Chaos. Very good! Just like the puzzling "W. 52nd" which, after a very ambiospherical intro, embraces a structure a bit jazzy where the rhythm is seduced by these breezes of trumpets which still caress the poetic universe of O'Hearn. The rhythm slow, "Shadow Country" infuses its chords of a guitar with harmonies tormented on a bed of bubbly percussions. The synth layers which decorate the very melancholic musical setting of “Little Things” paint here some shadows of mist which welcome the lamentations of a Berber violin. The effect is rather attractive. The title-track is breathing of paradoxes. If the rhythm sounds subdued, with rustles which stick together in the shape of hoops of felt moving in echo. The melody is pensive and glues its notes of a forsaken piano on a bed of cracklings, forging a delicate diurnal reverie. After the somber and very pensive "Soft Portrait", "Slow Drum" plunges us back into the oriental ethnic moods with an intro filled by the perfumes of a Sarangi. The sound texture lets sparkle a thick cloud of sound dusts which fills the air of a thousand chimed sound particles while that slowly the tempo turns into a slow disarticulated horse ride which bends the rhythm under jerky orchestrations. "Nocturne in 3 Parts" is an ambient track on which Darshan Ambient hooks the lamentations of a six-strings which drags the poverties of the world with the sound of distant bell ringings. No matter the approaches, Michael Allison always manages to instigate our interest by delicate harmonious endings. The tears of violins which cry into some maternal sighs open the very ambiospherical introduction of "Fields". The percussions build waves of emotions while that, all slight, the guitar forges one of these meditative melodies which furnish the universe of Darshan Ambient. I know! We have already heard, but the effect always remains so fascinating. It's the same thing for "There!" whose opening presents an orchestration of violins which flows in a structure of musical cannon. We are in Steve Reich's universe, but with a more melodious approach. It's very beautiful! More cheerful, "Watch your Step" presents a beautiful ballad approach of an urban western genre with a rhythm finely drummed which submits its mane of rebel to the soft pads of a synth of which the aromas of sadness succeeds at no moment to eradicate the beautiful harmonies of the guitar. "Exile" bears the weight of its meaning with an ambient approach where the piano cries in the thoughts of a meditative guitar. 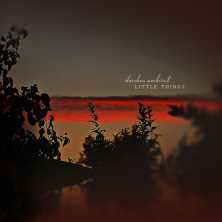 With “Little Things” Michael Allison goes out of his zone of comfort with a more audacious musical vision. Always dragging his poet's coat with a tormented soul, the American rural bard digs up the roots of an eclectic and electronic folk to paint it of his unique colors of melancholy. There are several winks of eye in this album, where from eclecticism, to artists such as Patrick O'Hearn, Jim Combs (Sensitive Chaos) and even Miles Davis of which the paradoxes unite marvellously in a work which also drinks of a river of tribalism. A very beautiful album with wandering poetry as only Darshan Ambient signs since A Day Within Days. The sequencer is heavy. After an intro dressed of veils sifted of metal, it frees pensive keys which waddle deftly into some mists filled of ochred voices and of electronic tones which chirp such as a Phœnix losing its ashes. And it sideslips. It takes the control of a spheroidal rhythm which rises and falls in a horizontal spiral. Dispersing some silvery drizzle and frightening the chthonian voices, it spits a fury à la Ricochet where synth pads of voices float like spectres on the edge of fleeing hell. And the solos fall. Binding itself in this unbridled rhythmic ride, of which Ruud Heij varies as much as the tones as the velocity, they cleave through the air, the rhythm and roars with passion while freeing these pads of translucent mist which glide as tramps over a city burning. Recorded in concert during the 2004 E-Live Festival, "Blind Watchers of a Vanishing Night" is one of the heaviest, black and most furious pieces of music in contemporary EM. It spits keys destructive of ambiences and it rocks the ambient airs with a breakneck pace which has nothing to envy to Redshift. Surprising, Ruud Heij weaves a great universe of sequences where he tames his keys by painting them of nuances and harmonies on rhythms which, if they are motionless, are lighting our ears with movements and crisscrossed lines which remind unmistakably the rhythmic phases of Tangerine Dream in the Encore years. 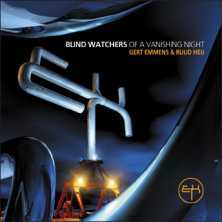 “Blind Watchers of a Vanishing Night” is the 2nd album of Emmens/Heij. It tracks the exploit of the Dutch duet during concerts following up the release of Return to the Origin, of which one of these concerts coincides with the launch of the album at Alfa Centauri Festival in Huizen on Mars 2004, for tracks 2 and 4. The other tracks were played live at the famous Festival E-Live of Eindhoven in October of the same year. And, as you are going to hear, it breathes of the same harmonious symbiosis between the rhythms of Heij and the cosmic, oniric clothing pattern structured by Gert Emmens. If the movement of the sequences, which flicker with swiftness, awakens an imprint in your ear, then you recognize Solaris from the album Return to the Origin. Segmented in 6 parts, "A Journey through Time" negotiates its rhythms and ambiences in a beautiful improvised symbiosis. After the kicks of the sequences from Solaris, Red Clouds over a Misty Swamp submerges us of slow morphic strata which float such as big ink stains soaked with voices in a black hole with the contours radiating of translucent lights. The voices and the orchestrations awaken a hint of Vangelis while the sensation to float in hyperspace assails our senses. Whereas The Rise and Fall of Atlantis and Waiting for the Day to Come are exchanging the same pattern of rhythms and moods, the 5th part of "A Journey through Time", offers a superb slow rhythm which waves with a fascinating sensualism in its curves. This quiet rhythm magnetizes our inner senses and leads us quite slowly to the finale of "A Journey through Time" which becomes soaked with slow and whimsical morphic strata in order to complete the journey between the rhythms and ambiences that the duet learnt so well to develop with Return to the Origin. Marrying a little the same rhythmic exhilarating of Crystal Tears, "Moments of Unexpected Sadness" is a superb track which bears its name marvellously. It's melancholy which waltzes in the ritornellos of a delicate movement of sequences of which the knocks of bevels of the morphic keys succeed at no moment to tear this mellotron mist as much musical as that of Moody Blues. And those ethereal voices that Emmens draws for our ears, they are wonderful of tenderness. They are as mesmerizing as fragile and sing with the same maternal sweetness as the fine solos that the Dutch synthman succeeds in weaving from his melodious mists. This is a very good track which tickles the soul, you have no idea! "Conspiracy of Two Forces" is also offering a structure of ambient rhythm where the stationary sequences of Ruud Heij flit and intertwine their rhythmic wings with thee fine modulations of a movement which oscillate in the charms of a dreamy synth and of its nasal solos. Heavier, but always so motionless, and coated by a mystic cosmic mist which lets pass beautiful romantic solos, "Driving Home on a Rainy Night" encloses a beautiful album of which the biggest quality is to be in the continuity of Return to the Origin.